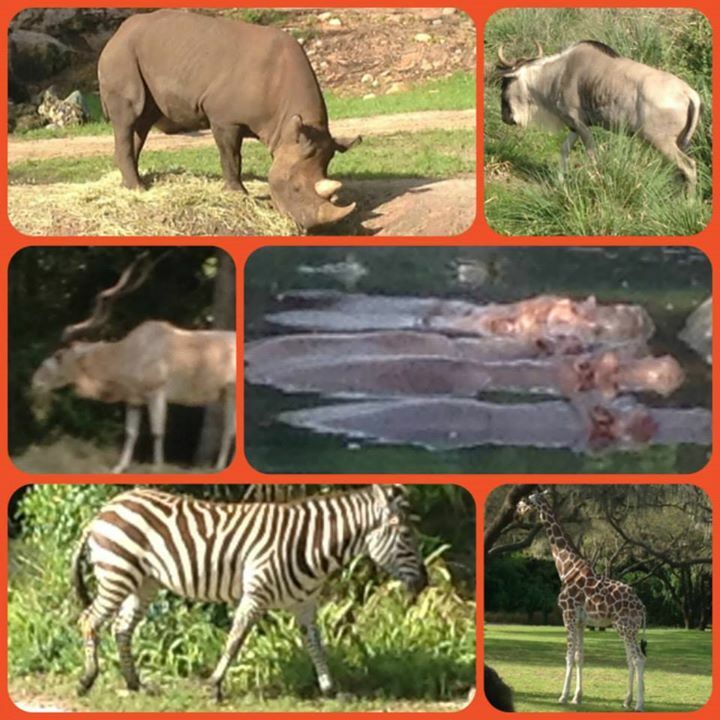 Disney’s Animal Kingdom – For Adventurers Big and Small! 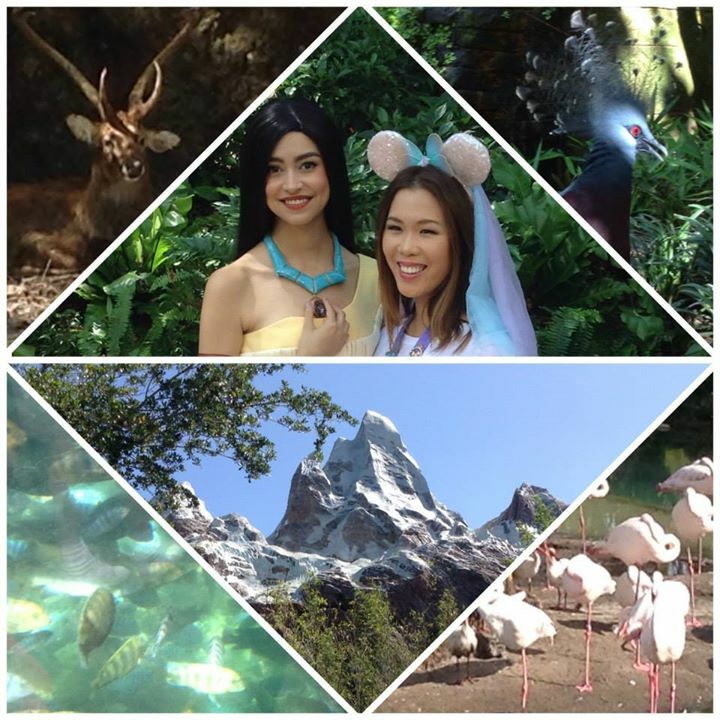 So here’s my Disney vacation part 2 post – Animal Kingdom! Again, as I stated in my Disney Proposal Engagement post, Disney is simply second to none when it comes to making that magic experience a reality. They’ve got every minute detail down to a T. Some of the highlights for me of Animal Kingdom included: Kilimanjaro Safaris, Expedition Everest, Meeting Pocahontas and my Disney character dining experience at Tusker House. This is the attraction that most impressed me of any and all wild animal experiences I’ve had world wide. That’s right, WORLD WIDE. What was so amazing about the ride was not only were the animals real, but every corner we turned, there was a different African safari animal there. There wasn’t a “Oh I’m sorry. The dolphins come out every day, all year round, but today they’re not here for some unknown reason.” like I received 3 days in a row after visiting Monkey Mia Bay in Western Australia for a week with no dolphin in sight… You pay to see animals, and you have a check list, and Disney will make sure you check everything off that list! And, this is by no means a cruel tourist attraction with animals caged and poked for your entertainment. No. This was the most impressive wildlife sanctuary with African native plants, rocky caves, gushing rivers, all as far as you could see, and it was HUGE. This is a whole piece of Floridian country that was empty and Disney turned it into the best African safari land to exist outside of Africa. Rhinos even blocked the road which stalled our jeep for about 10 minutes, and we had to wait for giraffes to cross so that we weren’t too close to them as they went about their merry way. I think Disney’s become such an expert at scheduling the feeding times for their rotation of animals that there’s no way you won’t see enough of them to have your jaw tired from being in awe of such awesome creatures. All that, and they also advocate for anti-poaching in Africa while educating park guests on endangered species and how to help. My advice is to Fast Pass this ride to your collection. My name is Susanna, and I am a thrill seeker (as far as rollercoasters are concerned). The scarier the ride, the longer I line up. 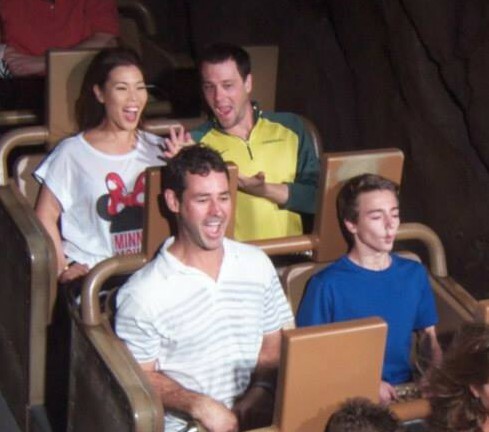 Expedition Everest is now my favourite ride of all of Disney’s theme parks. It knocked Magic Kingdom’s Space Mountain off the top of my list (weirdly enough I was disappointed with the Magic Kingdom’s version of Space Mountain compared to California’s Disneyland.). Expedition Everest is built in and around this gigantic mountain, larger than any man-made mountain structure I’ve seen inside Disney. It also has this great part of the ride where your throttling full speed toward a giant Yetti whose pulled apart the tracks, and instead of crashing into it, you back-peddle and race backwards down the rollercoaster. If you’re a no-fear kind of person, this ride will be a ton of fun for you. Make sure to Fast Pass this ride too! I’ve been to Disney a handful of times with friends who had been and done that, and nobody ever wanted to wait in line with me to take pictures with the characters. I know, Boo Hoo, poor me, grow up. My fiance, knew this very well, and he booked character dining experiences at each theme park, for me to take photos with every Disney character I had on my list, all while getting our daily fill of foods and Mickey waffles. Tusker House is the character dining for Animal Kingdom, and Donald, Mickey, Mini, Goofy and Daisy, each came to my table to hug me and fuss over my new engagement ring. We got to snap away with our new friends, and I didn’t have to wait 30 minutes to hug Mickey. For the tourist like me, who travels as far as she does (over 20 hrs flying) to get to Disney, I felt that photos with my favourite Disney characters was part of the envisioned experience, and not getting them was disappointing. So I’m glad to say that character dining allowed me to do that, and for that reason it was worth the money (sacrifice money for time is a good exchange for me). Depending on what meal of the day you do, it can cost about $15-$60, and some Disney Dining plans may be inclusive of this experience. Some tips are: when you leave your table for the buffet, make sure you don’t miss the characters as they come around. Also, make sure to book a table in advance, since I believe they don’t take walk-ins. Another note is that some of the characters rotate, so if Daisy isn’t there, some other character will substitute. 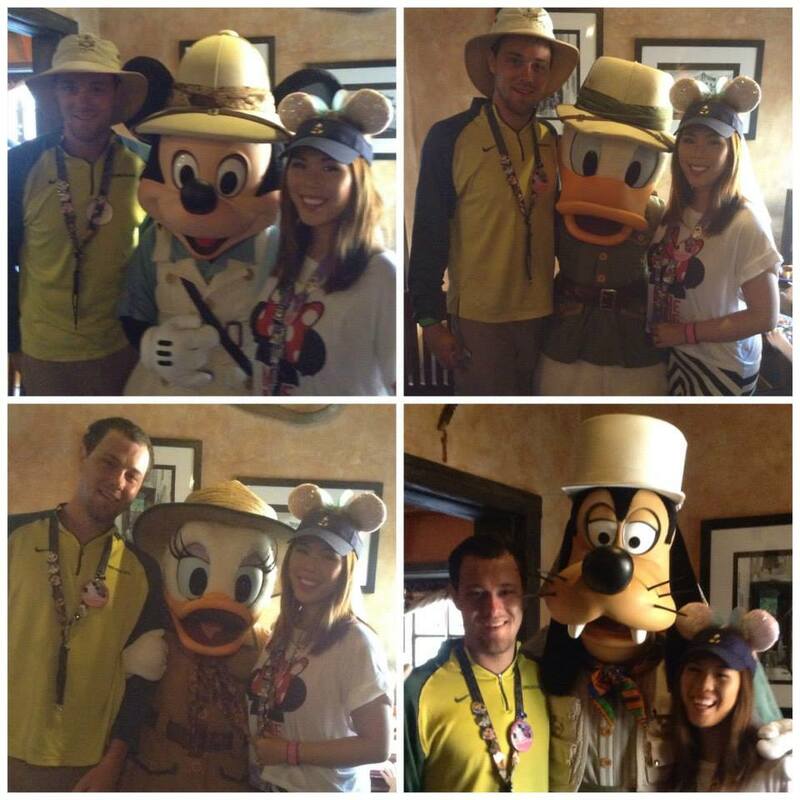 Now I will write a separate post about Character Dining Experiences at Disney, so stay tuned! This also relates to my value on taking photos with my favourite characters, but I highlighted Pocahontas for some specific reasons. Firstly, I didn’t have to line up long to see her (comparatively, 20 mins is short). Secondly, I was checking photos with Disney Princesses off my list of character photos, and I had already seen the other Disney Princesses at Cinderella’s Royal Table character dining experience (I will write about this in a separate post). Thirdly and most importantly, Pocahontas was one of the best Princesses I got to talk to (Mulan was also cool). She didn’t play up the weird princess voice that the other princesses do (eg. Cinderella, Snow White & Rapunzel), and those voices are WEIRD. She also was just plain fun and playful, and she was the prettiest Princess I met in person. Yup, with all the costume stuff, sometimes the princesses look a bit weird in person. Her appearance times should appear in the times guide/park map that you receive when you enter the park. Make sure to line up prior to her scheduled appearance! Side Note: One of the few princesses I didn’t meet were Frozen’s Elsa and Anna. That Disney film came out not too long ago, so they were very popular. No kidding, there was a 4 hour wait at Epcot to see them at the Norwegian pavilion. 4 HOURS!!!!! Moms and Dads were trading places to line up while the other took the kids around the park…. At least that is what one mom told me while we were lining up to see Mulan. So there you have it, my Animal Kingdom highlights. It’s a seriously fun part of Walt Disney World, and my next favourite place outside of Magic Kingdom. For my friends that would conquer the distance to do Disney World from outside of the USA, make sure you leave enough time for this park (preferably 1 day, but at least half a day). If you have any other Animal Kingdom experiences or tips to offer, leave a comment below! 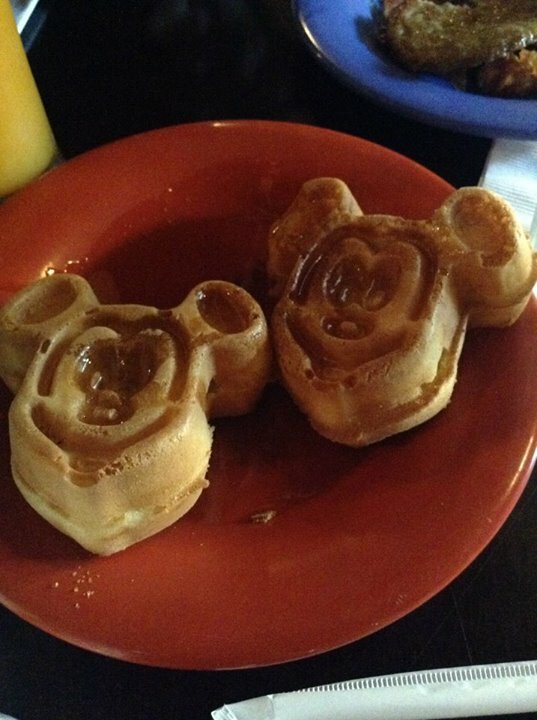 Micky Waffles were one of JJ’s favourites! As a native Floridian, I remember the coverage of traffic jams when WDW opened. I went once or twice as a teen – went to “Grad Night” with Tracy Moss in 1979! I don’t think I went to Dsiney again until I had kids – probably a 10 year hiatus. And boy had it changed! With the addition of Epcot.. then Disney-MGM Studios. I have never been to Animal KIngdom, but reading your post makes me want to go. Jessica and JJ (my son / your fiance) have always loved WDW! We used to take them to the character breakfasts for the very reasons you note: you get to meet and hug, and take photos with all the characters. There was one small spot in a play area where you could meet Mickey and Minnie privately and briefly after you went through their fun house. Disney has great discounts for Florida residents, and staying on the property can save so much time / transportation that I think it’s well worth it. The only thing I would add to your excellent advice is: bring your sunscreen and drink plenty of water!